The mothers were magnificent in the mother of all relay races. Eight teams lined up for the 7 a.m. start of the 100K relay at Toro Canyon Park east of Montecito. Race director Jim Kornell said they would actually cover a distance of 65 miles (100 kilometers would be about 62 miles) to reach the end at Nojoqui Falls Park in the Santa Ynez Valley. The mostly paved route went west on Mountain Drive, up the steep and winding Gibraltar Road to East Camino Cielo Road, across Highway 154 to West Camino Cielo Road, down Refugio Road to Highway 246 into Solvang, and along Alisal Road to the finish line. 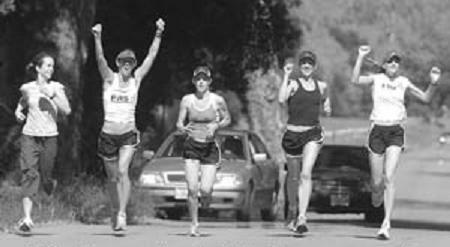 On the road ahead of the teams were four hardy solo runners who started at 3:15 a.m. Three of them would drop out with various ailments brought on by hours of pounding the pavement. Andrew Maxwell, a 22-year-old triathlete, was impervious to the punishment and virtually romped into the Nojoqui Park entrance shortly after 3 p.m. His time on the run was 11 hours, 53 minutes, and 41 seconds, the fastest ever recorded in the event that has been staged off and on since the 1980s. Finishing just minutes behind Maxwell was Q-Angle’s anchor runner Cheryl Hess, flanked by her teammates Melissa Goode, Martha Blackwell, Amy Tracewell, and Annie Toth. Their winning time was 8:11:46, a new women’s record. The DP Alumni five-man team (Travis Bower, Paul Shields, Willy Rossow, Ken Ardouin, and Nicolas Lebrero) finished almost three minutes later in 8:14:41. Translate that relative time difference into a sprint-say, 100 meters-and the teams would have been six-100ths of a second apart. “It was kind of exciting,” said Toth, who put Q-Angle into the lead while running back-to-back legs totaling 16 miles on Camino Cielo Road. The relay was divided into 10 legs, with each runner doing two of them. 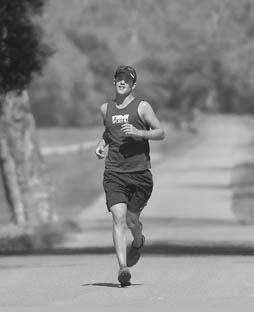 Blackwell, a former Oregon cross-country runner, also ran consecutive legs, powering 12 miles up Gibraltar Road to La Cumbre Peak. It was Blackwell who came up with her team’s name. Q-Angle refers to a measurement of the knee’s alignment with the hip. “When you have children, the angle increases,” said Blackwell, the mother of two. “The expansion of the angle leads to more aches and pains.” But rather than whine about it, these women celebrated their anatomical uniqueness. It helped that they had two former small college All-America runners in Goode and Toth, the lone maiden of the fivesome. The third team to finish was the coed Trail Mix (Elda Rudd, Leah Etling, Todd Bryan, Carl Legleiter, and Andrew Ostarello), followed by the Happy Idiots and another women’s team, Got Estrogen? There was a spirited race for the next spot, as Eric Richards of Bada Bing overtook Chris Weir of Yes, We Arrrggghhh! in the last mile. Nevertheless, Weir’s teammates, attired in scarves and striped knee-high socks and brandishing plastic swords, made a joyous dogpile at the end of the run. Direct Relief International concluded the parade of teams-all of them proud to say yes, they are (or arrrggghhh!) tough enough.